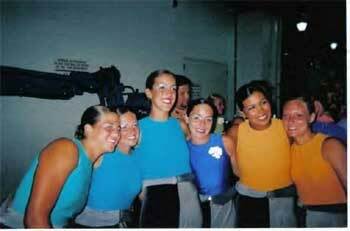 Lymarie Muniz, a member of the Boston Crusaders' 2004 color guard, sent in this pic. "This picture was taken in Denver right before finals retreat. Starting from the left is Meaghan Culver, Christine Durburoh, Angela Romo, Kelly Suarez, myself and Allison Gromack. Before every show we would get together and sing "Hold on for one more day" by Wilson Phillips. It became our tour song. And now we call ourselves the BAC CG 04 singers!" Thanks Lauren!